These Beach Day Pudding Cups are a breeze to make and are a perfect recipe for the kids to help with! Open your pudding cups and toss the lids. Crush graham crackers and add the crumbs to the top of each of the pudding cups to create the 'sand'. Cut the Airhead Extremes into short segments to create your 'beach towels'. 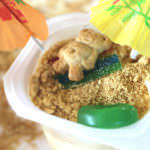 Add the beach towels, gummies and teddy grahams to create beach scenes in the sand on top of each cup. Add a drink umbrella to each cup to finish the beach scene! You can substitute crushed up Teddy Grahams for the graham crackers. Blue food coloring can be added to the pudding to create 'water'. My favorite food color is AmeriColor Soft Gel Paste. It's a very concentrated and high-quality gel, so just a drop or 2 will create a beautiful hue. Tons of colors available. There are many fun choices for creating your beach scene beside the items listed here. Explore the candy section for other fun options like gummy sharks or sea stars!